Date: Aug 2012 i Previous editions(s) can be found in the Related Items tab. Covering the full spectrum of heavily regulated industries and corporate activities in a convenient Q&A format, the Corporate Compliance Answer Book 2012-13 helps you develop, implement, and enforce compliance programs that detect and prevent wrongdoing. You’ll learn how to use risk assessment to pinpoint and reduce your company’s areas of legal exposure • apply gap analyses to detect and eliminate flaws in your compliance programs • conduct internal investigations that prevent legal problems from becoming major crises • develop records management programs that prepare you for the e-discovery involved in investigations and litigation • satisfy labor and employment mandates, environmental rules, lobbying and campaign finance laws, export control regulations, and FCPA anti-bribery standards • make voluntary disclosures of illegalities as a major step toward reducing penalties and sanctions • and cooperate with federal agencies during investigations in ways that mitigate the legal and financial damage done by wrongdoing. 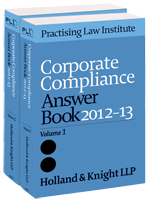 Corporate Compliance Answer Book 2012-13 features a number of recently revised chapters, covering • The Culture of Compliance • Witness Preparation • Procuring Computer Resources • Intellectual Property Licensing, Outsourcing, and Cloud Computing • Institutions of Higher Education • and the Consumer Product Safety Act. Featuring dozens of real-world case studies, compliance checklists, and best practice tips, Corporate Compliance Answer Book 2012-13 pays for itself over and over again by helping you avoid major legal and financial burdens. Essential reading at a time when your legal and regulatory burdens continue to mount, Corporate Compliance Answer Book 2012-13 minimizes the risk of litigation, penalties, sanctions, company turmoil, and lost revenue due to noncompliance.